Writing about books—starting conversations about a novel, a poem, a literary career—combines passion with dedication. 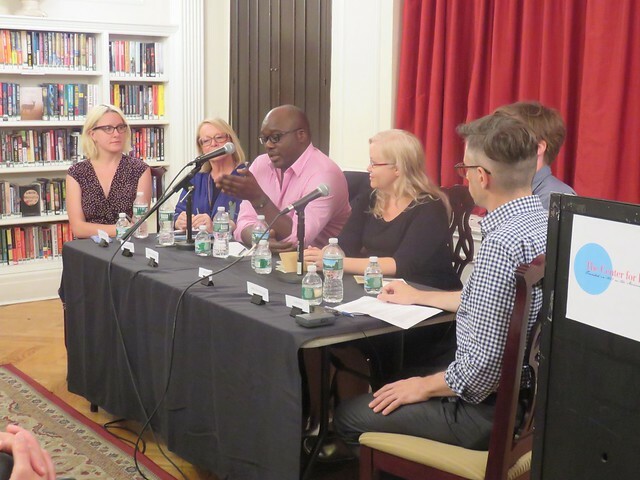 Five active literary and cultural critics, all members of the National Book Critics Circle board, discussed the art of writing about books. These panelists differed in background and experience; some write for legacy newspapers, others for online venues. All represented criticism as an engaging activity that challenges each to be perpetually in search of the new. The panel included Michael Miller, Jane Ciabattari, Michele Filgate, Kate Tuttle, and Walton Muyumba with moderator Tom Beer. This was a Brooklyn Book Festival Bookend event. Tom Beer is the books and travel editor at Newsday, and president of the National Book Critics Circle. He was previously an editor at Out magazine. He has written for Time Out New York, The Village Voice, The Los Angeles Times, and contributed to The Salon.com Readers' Guide to Contemporary Authors (Penguin, 2000). Find him on Twitter @TomBeerBooks.